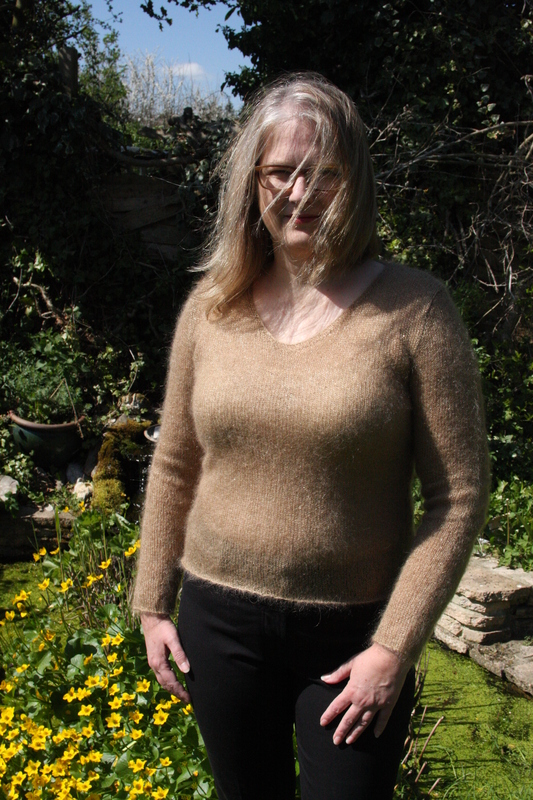 Today, I can finally bring you some modelled shots of my Gossamer pullover. I wrote in an earlier post that a discussion thread on Ravelry about the beautiful yarn Rowan Kidsilk Haze Eclipse, which was being discontinued, led to an impulse purchase of a dozen balls in the gorgeous golden shade called Virgo. Because the yarn can be rather bling in certain lights, I wanted to keep the design very simple and stark. 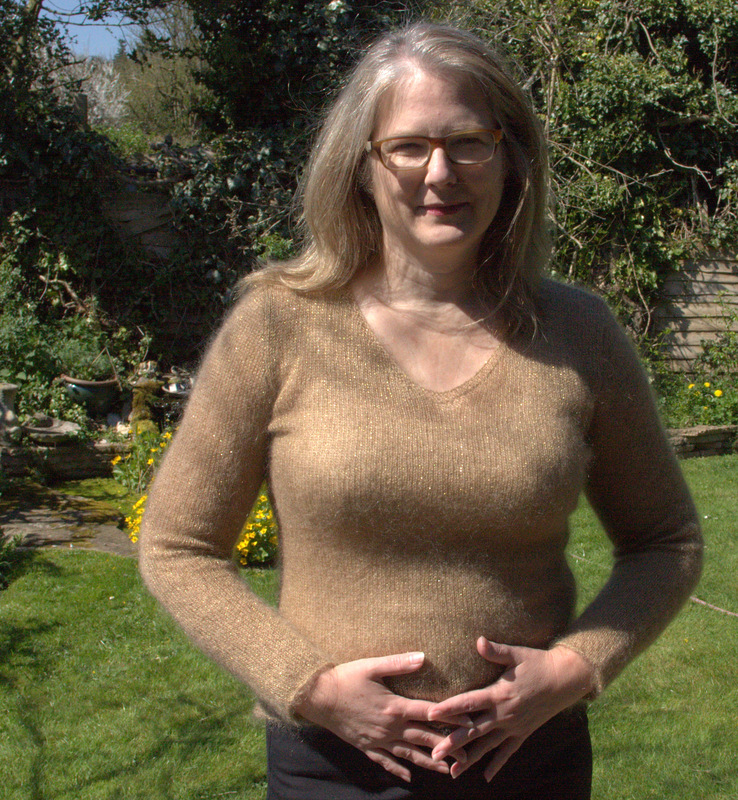 Instead of trying to find a pattern to suit the thoughts in my head, I designed it myself as I knit. 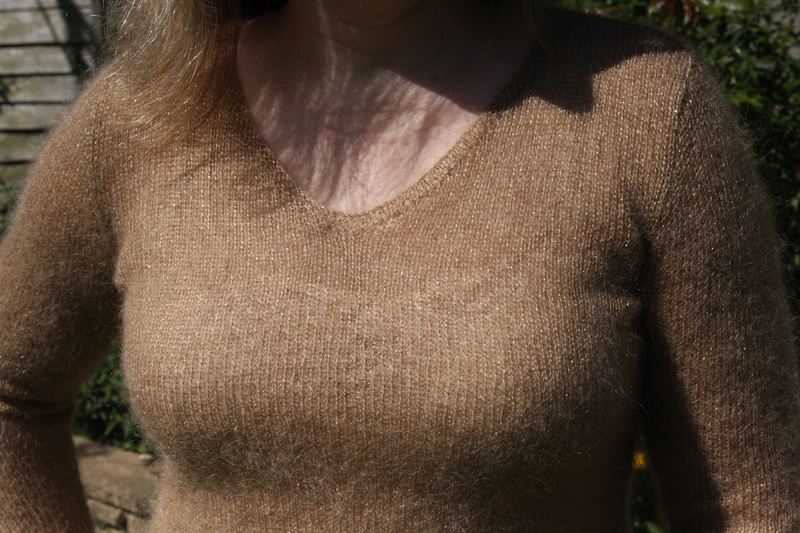 I think it is rather like a 1950s Sweater Girl pullover. 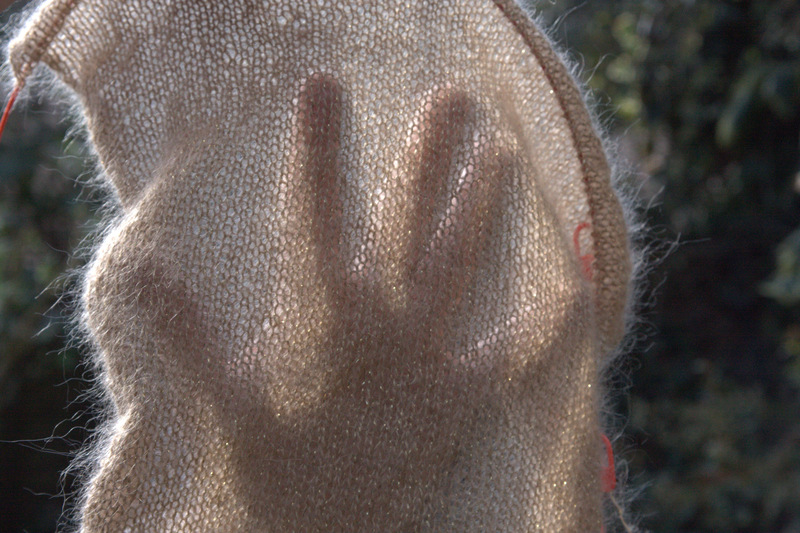 I call it Gossamer because it is as light as air. The lace tank gives just the right amount of cover without being intrusive and distracting the eye from the beautiful yarn. Here you can see the set-in shoulders. Again, I didn’t do anything fancy, just mattress-stitched the shoulder into place. I have been trying to decide whether to write this pattern up and make it available. Even though the Kidsilk Haze Eclipse has been discontinued, this would work perfectly in Kidsilk Haze, which comes in so many beautiful colours. What do you think? Is it worth the effort? 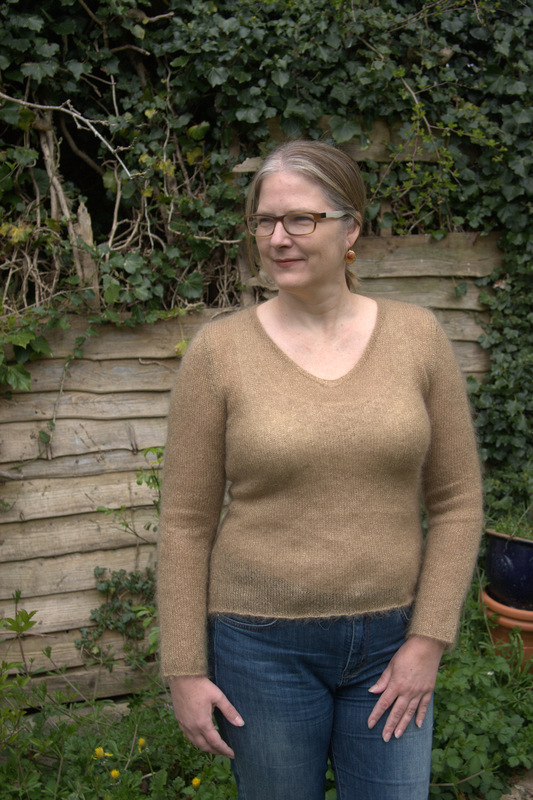 The thing I like best about this pullover is that it is so light – it weighs in at less that 125 grams. It is the perfect travel sweater. It won’t take up any weight in a suitcase, won’t show any wrinkles, and can add a bit of “Wow!” to a travel wardrobe. 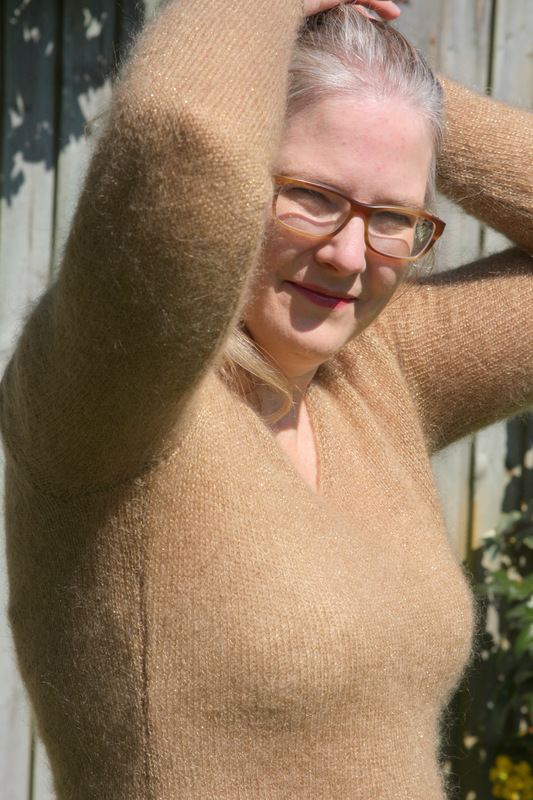 This entry was posted in Finished Project, Main and tagged Gossamer pullover, Kidsilk Haze, Kidsilk Haze Eclipse, Knitigating designs, Knitting by knitigatingcircumstances. Bookmark the permalink. Kelly, that sweater came out perfect. Beautiful work! Gorgeous sweater. Photos and write up are wonderful! Obote a resounding, “YES!” Write up the pattern! That should read – I vote! lovely garment, I like it! I would totally consider knitting it, if you wrote it up. It’s beautiful! And yes, I would love for you to write up the pattern! It’s beautiful. I would love to make this with Quiviut. What a treat that would be! Please write it up….I would definitely knit it for travel. I am always looking for pieces that pack small and don’t wrinkle. Thanks for the lovely modeled photos. I’ve only just discovered your blog and am in awe of the gorgeous sweaters that you’ve knitted for you and your daughters. 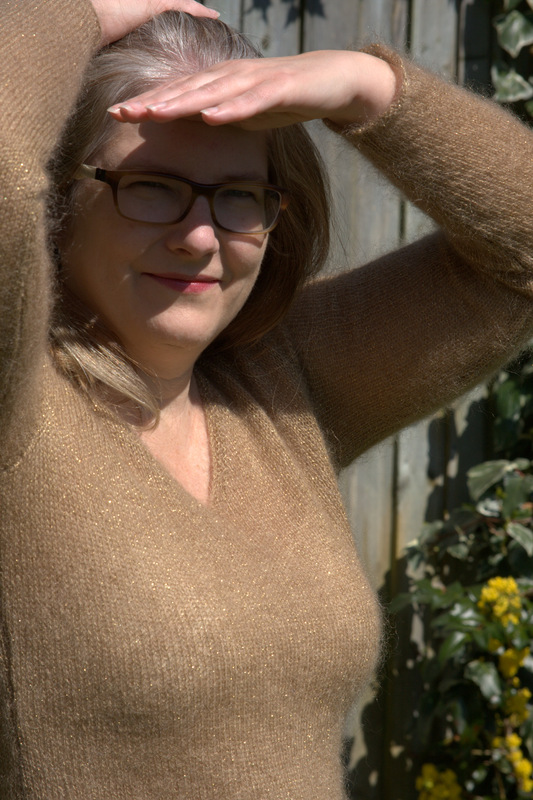 Your golden gossamer sweater is lovely and like the others who have commented I would certainly knit a version if you wrote up the pattern. Do write it up. It looks great and I’d love to make it. So lovely and light! Great color on you! And, it fits you perfectly. My vote is that you write this pattern and make it available. Your jumper’s beautiful and fits you perfectly. I’d buy your pattern! It’s beautiful! Well done! Any plans for your remaining skeins? A ruffle edge shawl would be a nice complement. I’ve made 2 in KSH and highly recommend it.